In an increasingly globalised world, where large multinational companies sell their products to dozens of countries and with the gradual transfer of its production centres to countries with lower costs, transport —and as a corollary, maritime transport— has become one of the main aspects and concerns of countries and businesses in order to compete in the global economy. The logistics chain of international freight transport is based on the multimodal chain, which includes door-to-door transport of freight from the factory to the end customer, combining different means of transport such as trucks or trains with ships, with maritime transport accounting for 90% of international freight transport and 68% of international traffic in Spain..
International maritime transport in Spain decreased by 15% in 2009 and it has still not recovered its pre-crisis figures. 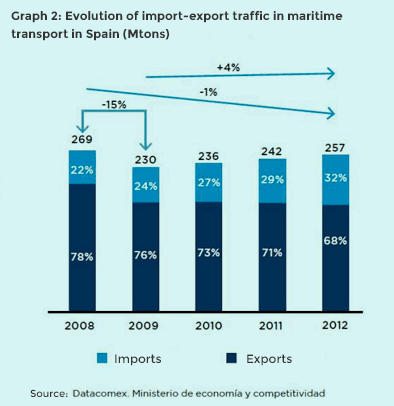 Since then, it has grown by 4% thanks to the growing internationalisation of Spanish companies which has led to the increase in the volume of exports, growing from 24% in 2009 to 32% in 2012 of international maritime transport in Spain. 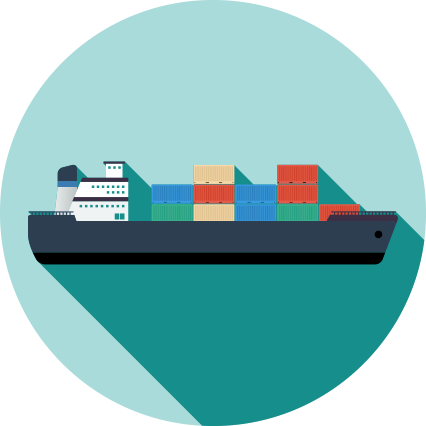 The Spanish port sector is a key element in the logistics chain of maritime transport and freight transport in general. It has a direct, indirect, and induced impact in the range of 20% of the GDP in the transport sector, which accounts for 1.1%2 of the GDP. Likewise, it creates 35,000 direct jobs and approximately 110,000 indirect jobs. 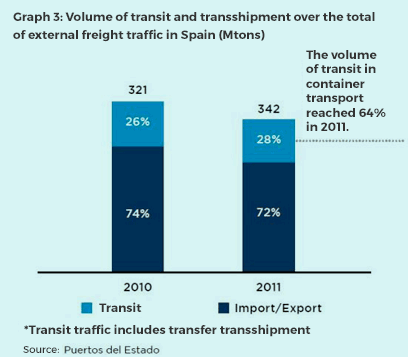 Moreovermaritime transport accounted for 13% of internal freight traffic in Spain in 2011. Spain has 46 ports of general interest, of which 55% are found on the Mediterranean, 27% on the Cantabrian coast, and the remaining 8% in the Canary Islands. The choice of one port over another is key for import-export traffic and for transit traffic due to different factors, among which are: the port’s geographic location, the costs associated with port operations, and the quality and level of the service offered. For their geographic location, the Mediterranean ports in Spain, constitute the maritime transport hub for Southern Europe, mainly competing with ports in Southern France and Southern Italy, and in relation to freight transit with ports in Northern Africa. The ports in Northern Spain mainly compete with the major ports in Northern Europe such as Hamburg and Rotterdam. Competitiveness is important in import-export traffic. Multinational companies, such as car manufacturers, steelworks companies, etc. decide on their location based on their cost structure, in which the transport of products is an important consideration. The greatest competition in international freight trafficbetween countries is found in transit traffic, which means attracting freight whose entry into the country will not be to the port in question, but instead, the port will only be an intermediate stopover, for another ship to finally carry the freight to the destination port. 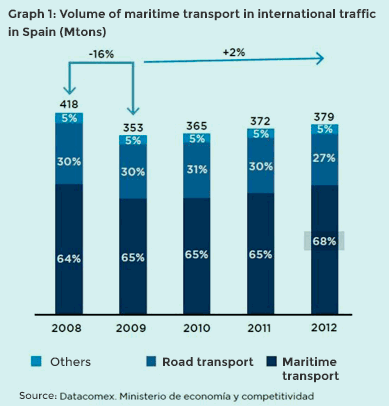 This traffic, representing 28% of the global traffic total and between 55% and 64% of containers in Spain, incurs practicallyno costs in changing ports, which makes it very volatile. For this reason, the efficiency and quality of the service are key, with not only the cost of the service but also the cost and time associated with the ship’s stay in port key aspects to bear in mind. The competitiveness of maritime transport is thus a key factor for domestic companies that export its products and for foreign companies that decide to set up their production centres in our country. 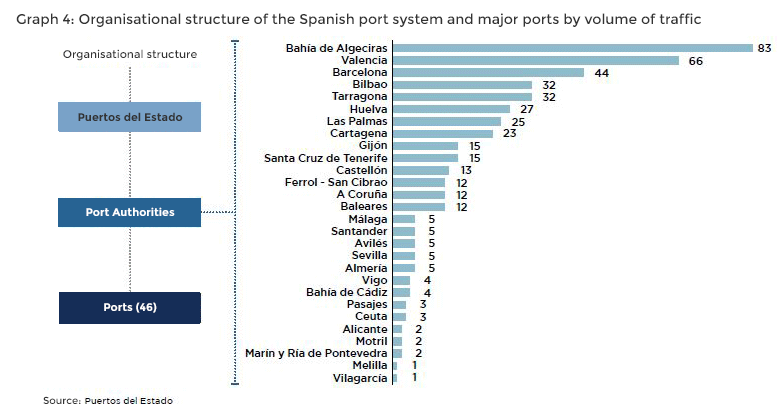 The Spanish port system is made up of 46 ports that are managed by 28 Port Authorities, whose coordination and control of efficiency the public institution Puertos del Estado is responsible for. The management of ports of general interest is done under the so-called ‘landlord’ model, where the PA is merely a port infrastructure and land provider, regulating use of this public domain and ensuring availability and quality in the provision of different port services. These services are mainly provided by private operators under an authorisation or concession arrangement. The Boards of Directors of the PAs are the government bodies which make the decisions for the ports. These are composed of 80% public officials and only approximately 20% of the seats are available to private investors, always upon election by the rest of the Board. The PAs are funded through the fees paid by the private companies that carry out its economic activity in the public port domain as companies providing services. Several types of fees are applicable: occupancy and activity fees, usage fees, and aids to navigation fees. The occupancy fees are paid for occupying public port domain, by virtue of a concession or authorisation granted and includes the provision of common port services to the concessionary company related to the occupied domain. These fees are fixed for the operators and for the PAs and constitute 25%4 of its revenues. The occupancy fees are revised upwards annually, having risen over the last few years. An analysis conducted on PIPE’s terminals have shown that occupancy fees have increased in 64% of the cases, with an average increase of 19% with respect to 2007. Some terminals have received rebates on their occupancy fees, with considerable discounts for those with a substantial drop in profitability. Despite this, there is no across-the-board discount policy due to the Port Authority or the terminals’ financial requirements. The activity fees are paid for engaging in commercial, industrial, or service activities. These fees are variable and depend on the volume of traffic managed, with a minimum established in the concession agreement. The PAs collected 12% of its revenues in 2011 through these fees. The usage fees are paid by the port community agents and shouldered mostly by the port operators, constituting the greatest revenue for the PAs, comprising 52% of their revenues in 2011. In turn, it is divided into several types. Vessel fee, due to the use of the waters in the port’s service area and the port’s facilities. Freight fee, due to the use of the facilities and areas associated with the loading and unloading of the vessel, road and rail land-based accesses and roads, and other port facilities by the freight, including its stay in the service areas. Fresh fish fee, due to the use of the port’s waters and its facilities by the fishing boat or merchant ship, and the land-based facilities. Sport and recreational craft fee, due to the use of the port’s waters and facilities, as well as the craft’s stay on the docks. Fee for special use of the transit zone, due to the use of the transit areas and manoeuvring areas by the freight and transport equipment. Aids to navigation fees, due to the use of the maritime signalling service.